For those that don't know, there are various eyelid types. Most just differentiate them by monolids and double eyelids. Monolids are typically what people think are "Asian eyes." I think only Asians have this type of eyes...Monolids are when your eyes are opened and you see no creases. I think big monolid eyes are really pretty and kinda rare to have. They're my favorite type. My cousin Diana and my brother has this type of eyes (big monolid eyes). My bf has the stereotypical chinky kind of monolids hahaha. I think it looks cute on him though ^^. 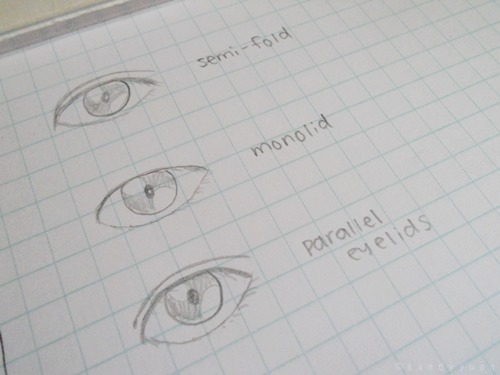 There's other types of monolid eyes, but I don't know what they are called besides just "monolid" or "single eyelids." Double eyelids are when people can see the fold or crease when your eyes are open. There are two types of double eyelids. Parallel Eyelids - when the top curve of your eye and the fold or crease is not touching in the inner corner of your eyes, but instead are parallel to each other. The creases on your eyelid do make a big difference to how your eyes look. The higher your crease is the bigger your eyes look. Sometimes it makes your eyes rounder or wider. I have the semi-fold/tapered eyelids. I think it suits me pretty well. However, this past week my eyelids were being weird and had extra creases. It made me have the parallel eyelids. 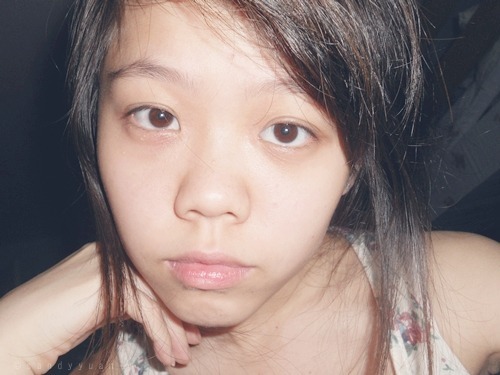 I thought it made me look alien-ish when I don't have eye make-up on. You can see it kinda made my eyes look bigger and even kinda like "puppy dog eyes" LOL. So yeah. I hope this helps explain what types of eyelids there are. I had questions about what "parallel eyelids" were which inspired me to do this post. If you aren't sure what type you have I'll be happy to tell you if you show me a picture of yourself. 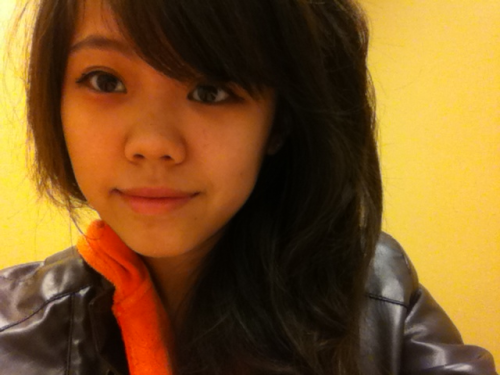 For example, when I have my normal eyelids (semi-fold/tapered), I don't line my eyes all the way sometime. I just line it half way outwards. I don't put any eyeliners towards the inner half. When I had the parallel eyelids I had to line the whole top part because it looks better that way and help to visually enhance the shape. Because the semi-fold double eyelids already pretty much "lined" the inner side of the eye I don't need to line it. I mean you can still line it haha, but to me I like it better half-lined. I love the second to last picture of you. I agree I love the second to last one. Are you wearing lenses? oh my gosh it's so pretty *spazz* LOL. I think I have semi-fold! Like I have a crease but my eye lid skin kind of over laps so I have to apply like 2x eyeliner since you can't see the eyeliner with just one normal stroke Q_Q I hope that made sense! Haha. 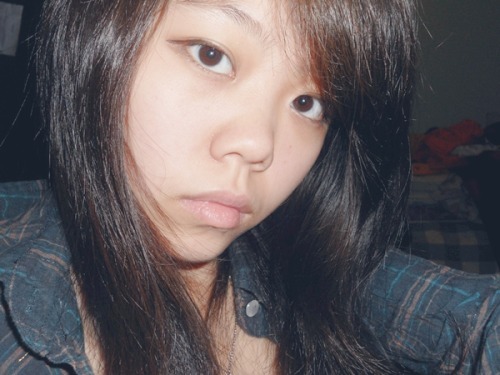 @linda: from kinda stalking your blog pictures, i think you have parallel eyelids. you have a very small gap in between the actual crease and the upper lash line at the inner corners. i think because of how tiny the gap between is, it seems like you have semi-fold lids. semi-fold lids actually have a distinct overlap at the inner corners. I kinda have part monolid part semifold. Is that possible? Yes it is! My sister is like that. Overtime the eyelid can "sag" which can make your eyelid fold more. Some people even use eyelid tape to try to make double eyelids/tapered (semi-fold) eyelids and after using that for a long time, it can eventually become one of the other types of eyelids. However, after your eyelid becomes tapered (semi-fold) or double eyelids, it's not likely that it will go back to monolids. what did you mean by "when i had the parallel eyelids for a week"? In the last two pictures I have parallel eyelids because my eyelids had extra creases and was a bit swollen due to rubbing it too hard, crying, or I just opened my eyes in the morning and it's just like that. I didn't use eyelid tape or glue if that's what you're wondering haha. I have a monolid but there's just BARELY a little bit of skin underneath the outer corner of my right eye. Im probably the only one who knows this since Ive been paying a lot of attention to my lids these past months. But it's also the same on my left lid, but it's even smaller. I didn't even notice until last night when I saw that my lid was tucking just barely any skin underneath but you can't see it so monolid? yes, that's monolid. 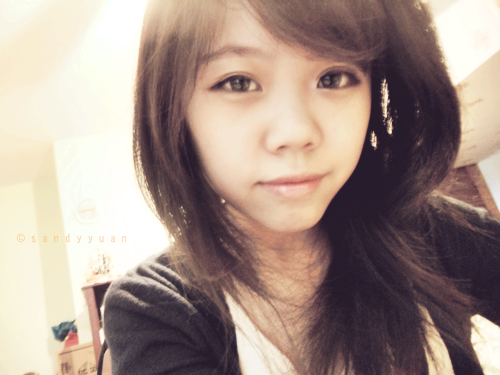 my sister's eyelids are like that ^^. monolids, parallel eyelids, and tapered eyelids are all determined by how it looks when your eyes are opened. you have tapered eyelids like me! judging from your icon picture it seems like one is parallel and the other is tapered eyelids. (it could be the angle from how your picture is taken). nonetheless, you have double eyelids! Hi, I was just wondering what type of eyelida I have. When I open them wide, they are double eyelids and my left eye has a more prominent crease than my right. However, when I'm just normally opening my eyes they have multiple fine creases and one main crease. What is this called?